Two going on twenty. : Darian caught her first fish! Darian caught her first fish! And it is a record size! 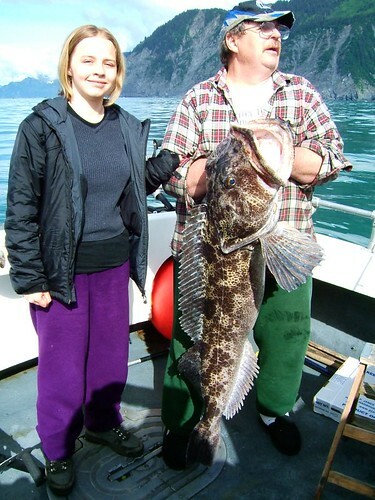 The captain said he has never seen a Ling Cod this big before, they are usually under 10-25 lbs. Darian's was almost 70lbs! Holy smokes! It looks like a monster from the deep! She is a true Alaskan after-all...or has the blood of one! She was born here wasn't she? I can really see her Dad's crooked smile in that picture, but in real life she has the stunning features of mom! I hope you guys had (or are having) a wonderful visit. Thanks so much for loaning me your husband. What a musical work-aholic! I definitely got my money's worth. If you get this message, you guys should come by my restaurant before you leave...Istanbul Cafe, in the Qupqugiak Inn near Arctic on 36th.